Apple Cider Vinegar Marinade is now my new favorite basting sauce. The benefits of apple cider vinegar are out there for everyone to read about. 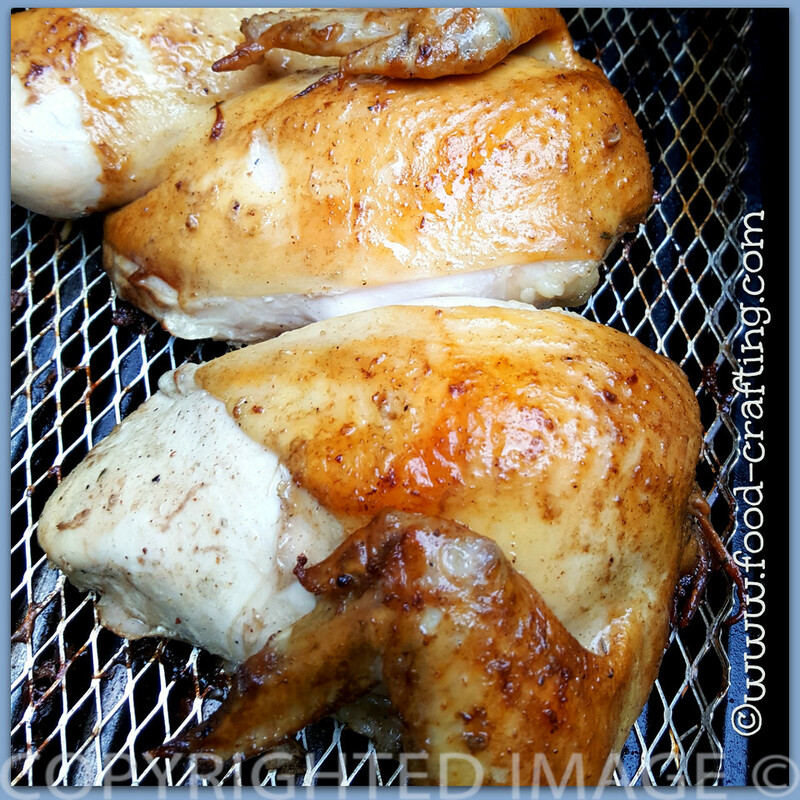 It’s all the rage for weight loss and other home remedies but what about marinating poultry and meats? Starting this week, I am keeping a gallon jug of apple cider vinegar in my pantry to use in recipes. 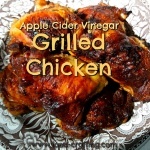 Apple Cider Vinegar Marinade Is Perfect For Grilled Chicken! I’ve never had chicken turn out as tasty and tender as when I experimented with the famous Cornell’© vinegar chicken marinade. The chicken was just as tasty cold for lunch the following day. We grilled it outdoors as the recipe called for and everyone from the matriarch of the family to the grandchildren proclaimed it the best tasting grilled chicken ever. Then they quickly added that it was almost on par with Margaret’s barbecue sauce. Inspired by a post on the Eating On A Budget website, I thought the marinade would be a nice change for the grilled chicken dinner planned on the Memorial Day holiday. Another plus about this marinade for grilled chicken is that it works just as well if you cook chicken pieces in a very hot oven (425 degrees) for about 1 hour. 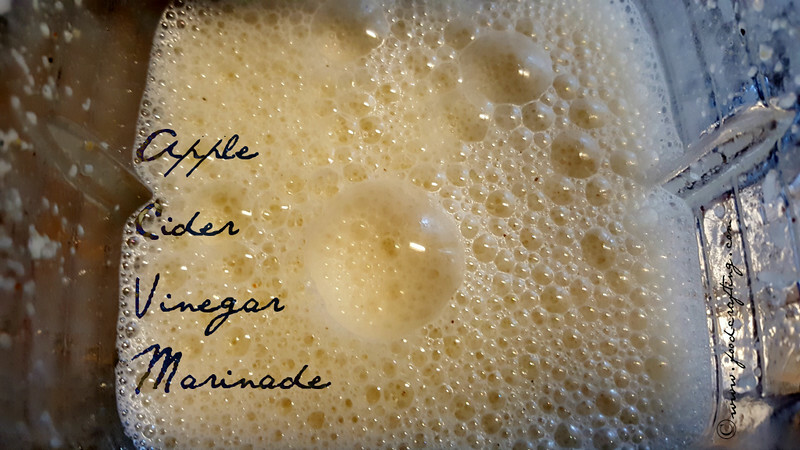 My apple cider vinegar marinade is a variation on the theme. The basic ingredients are there but if you know me, I just have to put my spin on any recipe. Not because the original version lacks a certain “je ne sais quoi” but just to add a hint of our favorite flavors. The cider vinegar is the main ingredient in this recipe so regardless of various tweaks, the tangy flavor of the vinegar comes through loud and clear on the taste buds. Don’t limit yourself to chicken pieces. the Salamida marinade comes already bottled and is the “choice of fundraiser BBQs everywhere“. How convenient is that for last minute food prep? The original recipe is rather scary if you are on a sodium restricted diet. Even if you are not on a salt free or restricted diet, the amount of salt called for was enough to make me cringe. Those are quantities used for brining and, in effect, the apple cider vinegar bath is a brine. by any other name. I reduced the salt content by 1 full tablespoon. The meat was still well seasoned. The vinegar will soften the meat fibers (you could use this marinade on pork with great sucess) but think of it this way – salt is also a meat tenderizer! Say goodbye to tomato based BBQ sauces and switch to tangy marinade! While it draws out the liquid in meats, it also change the texture of the meat. So don’t forget to baste often while you grill those chicken pieces. The first time I made the recipe to grill outdoors, the chicken was marinated for about 6 hours. This last batch of bone-in chicken thigh pieces shown in the featured image (and “grilled” in the oven) spent just over 24 hours in the vinegar bath. The quantities called for in the recipe may seem like an insufficient amount of liquid in relation to the amount of meat but it is not the volume of liquid that counts here – its the combination of ingredients! Did you know that the Salamida© company also makes a Spiedie sauce and marinade? Ingredients include vinegar, oil, pasteurized whole egg, salt, black pepper, Garlic and paprika. It’s also sugar-free, gluten-free, with no artificial flavors or preservatives which is perfect for certain restricted diets. Three cups of the apple cider vinegar marinade will easily marinate and baste several chicken halves and is more than enough to marinate two family size packs ( 20 pieces) of chicken thighs. Don’t Have The Time To Marinate? Years ago, I purchased a Food Saver® vacuum sealing system. The DH was sure that we could save money by buying bulk portions of meat, dividing them into individual meals, and freezing them for later use. One of those problems was the fact that ground beef does not make a filet mignon. He did not like the texture of previously frozen meats and became tired of eating the same type of meat for more than one meal. So, the primary purpose for the purchase changed from freezer prep to simply adding a vacum sealed layer of protection to those few pieces of meat we did freeze. It also became my favorite way to marinate meat! Create a food saver style bag, pour in the marinate, add the meat and seal. BAM! Until the Food Saver® company came up with containers instead of rolls. The first containers were canister shaped but they must have been reading my mind when they came out with marinating containers! Imagine being able to infuse maximum flavor into meats and vegetables in less than 15 minutes instead of hours! 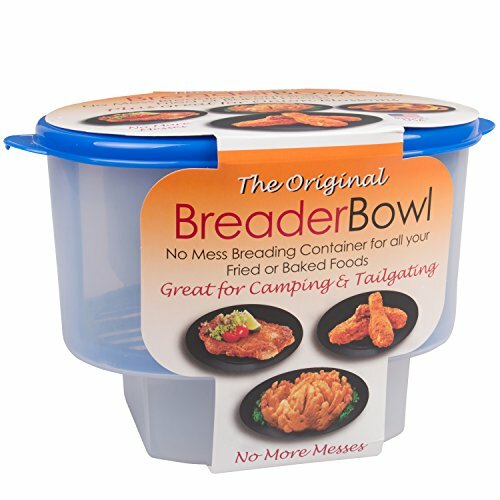 These containers are perfection for small boneless pieces of chicken, tenderloin steaks or pork chops. Not only will marinating containers allow you to prepare this type of recipe in record time, but you will be amazed at how often you use them for everything from meats to fish and vegetables. An added bonus? 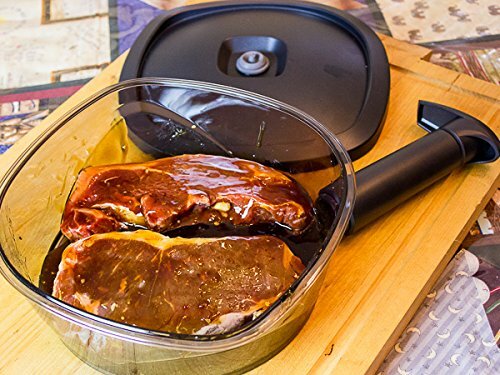 The container is dishwasher safe 🙂 To use the marinator, you will need a system that includes a hand held sealing capability. Make this apple cider vinegar marinade for your next batch of grilled chicken. You may say goodbye to tomato based BBQ sauces and switch to tangy marinade! Breaking out my Braun© hand blender – the ideal tool for this recipe. Place your chicken pieces in the zip top plastic bags. Pour the marinade over the meat. Refrigerate immediately. Grill the chicken over indirect flame on the grill or be prepared to handle an inferno when the marinade drips onto the coals. Even on a gas grill, the flames will flare up to majestic proportions on a low setting. To prepare in the oven, pre-heat the oven to 425 degrees. 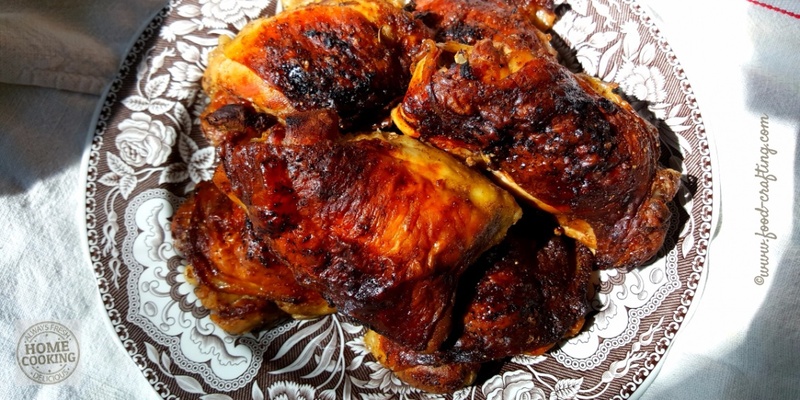 It takes about 45 minutes to an hour for large thighs to cook through. I used a large foil pan and placed the chicken pieces on a broiler rack. My taste buds did not distinguish between the oven roasted and the gas grill version. Charcoal grilling would impart another layer of smoky goodness. Round Out The Menu With An Orzo Salad! 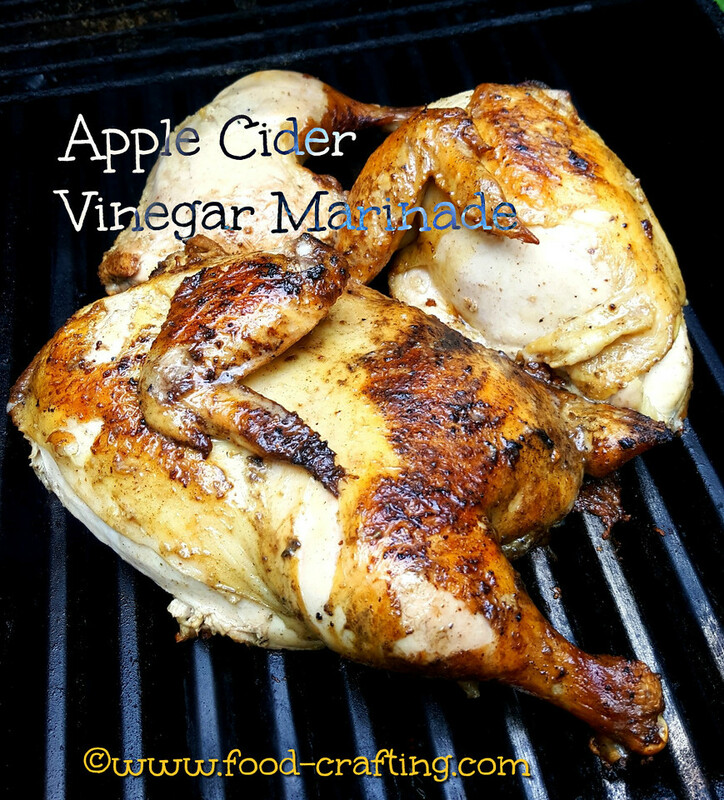 1 Apple Cider Vinegar Marinade Is Perfect For Grilled Chicken! 3.3 Don’t Have The Time To Marinate? 5 Round Out The Menu With An Orzo Salad! Cooking Picnic Ham: How To Make Dinner For A Crowd!